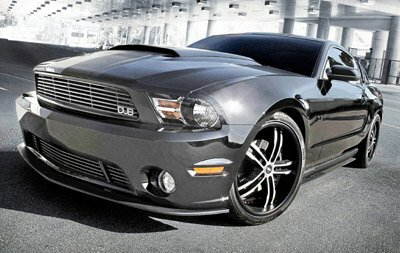 The 2011 DUB Mustang is a new special edition 2011 Mustang V6 based on the 2011 5.0 liter V8 car that was built for hip hop singer Nelly by DUB magazine. 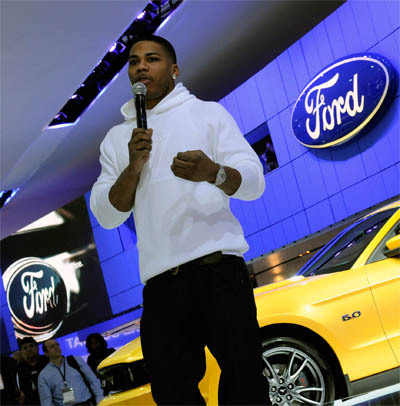 Ford teamed up with DUB magazine to offer enthusiasts their very own Nelly Mustang. Starting life as a standard 2011 Mustang V6 coupe or convertible, the new DUB Edition comes equipped with some nice Roush goodies, including a Roush front fascia and splitter, quarter window louvers and a windshield banner. It's also available with the panoramic glass roof option. Special 20" TIS wheels, with Pirelli tires and Roush lowering springs complete the look. Color choices include Black, Grabber Blue, Race Red and Ingot Silver. The one engine choice is the new 305 horsepower, 3.7 liter Tri-VCT engine. Normally you'd think the V6 option, when a car comes with a powerful V8 would be a setback, but not this one. The new 2011 DUB Mustang has tremendous performance and the best gas mileage in its class, achieving an amazing 31 mpg on the highway. Transmission options include the new 6 speed automatic and a six speed manual. Surprisingly, the automatic actually gets better mileage than the stick! And the drivetrain isn't just your garden variety econo box ratio. While it's not a race-ready 4.11:1 it's a nicely placed 3.31:1 rear end ratio, which gives you a great seat of the pants feeling, while not buzzing you at highway speeds. So if you want to make a big impression and a Mini just won't do, grab yourself a 2011 DUB Edition and party like a rock star!